KASHIMA, IBARAKI PREF. - Brazilian midfielder Leo Silva made an early bid for goal of the season as the Kashima Antlers came back to beat table-topping Nagoya Grampus 2-1 in the J. League on Friday night. The 33-year-old attacker struck the winner with nine minutes left at Kashima Stadium, picking up the ball near the center circle and scything his way past five defenders before beating goalkeeper Mitchell Langerak from close range. The visitors, who came into the match with four wins from five, were the more impressive side for most of the contest and will return home to Aichi Prefecture regretting missed opportunities. Gabriel Xavier gave Grampus a well-deserved lead two minutes into the second half before Shoma Doi leveled the scores with his first goal of the season. Silva, now in his third year with Antlers, said he could barely recall the highlight goal, which he dedicated to his son celebrating a birthday back in Brazil. “To be honest, I can’t really remember much of it. I remember shooting and scoring, and that’s about it,” Silva said. “I guess I could see there was space, and the defense opened up a bit so I could make my run. After falling behind on Xavier’s close-range opener — which went through hands and between the legs of goalkeeper Kwoun Sun-tae — the Antlers were fortunate to equalize through Doi in the 72nd minute. The winger tapped in from near the six-yard box after Ryota Nagaki found him inside a crowded area. Brazilian striker Jo hit the post from the area in the first half, then blew a chance to put up Grampus 2-0 in the second when he was unable to corral a through-ball from Xavier directly in front of goal. Xavier missed Jo inside the six-yard box late in the first half, squandering a superb counterattack by sending his cross behind last year’s golden boot winner. Frustrations between the teams spilled over in the closing stages, with Nagoya substitute Mateus triggering a shoving match, and earning a yellow card, with a rough challenge on Kento Misao. Grampus’ strong start to the season marks a major turnaround from last year, when they finished the campaign in a battle to avoid relegation back to J2. 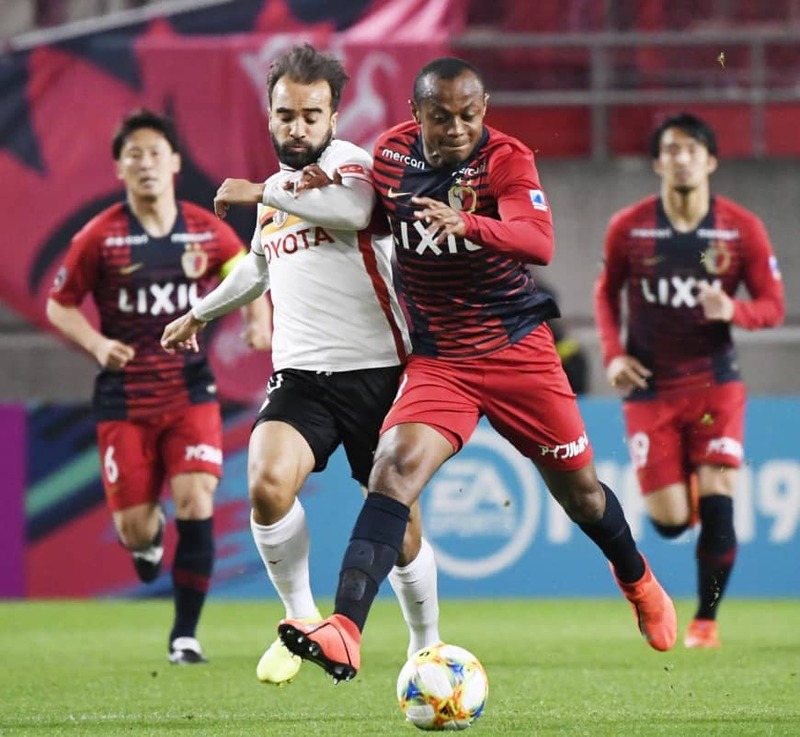 The loss leaves them one point ahead of second-place FC Tokyo, which has the chance to take first place with a win over Shimizu S-Pulse on Saturday. In other first-division action, Kawasaki Frontale were held 1-1 by visiting Cerezo Osaka at Todoroki Stadium. Kei Chinen equalized for back-to-back J1 champions Frontale after Yoichiro Kakitani put the visitors ahead with his first goal of the season. Marcus Junior scored a brace, while Rikuto Hirose opened his account, as visiting Yokohama F. Marinos thrashed Urawa Reds 3-0.